Never miss a day in Metropolis with this LEGO Superman clock! The Man of Steel gets the LEGO treatment in this poseable clock! This super clock features a digital, lighted LCD screen, an alarm function, and comes with adjustable arms and legs. 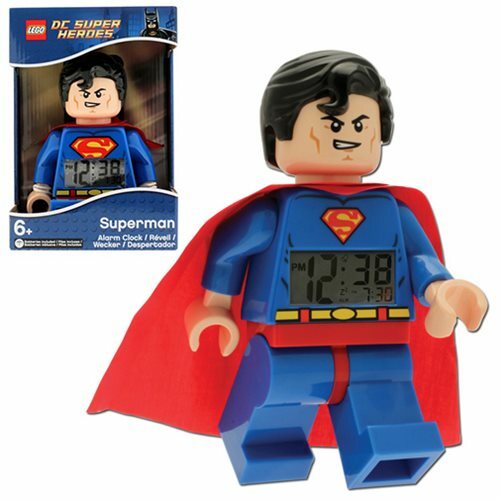 Made from super durable poly carbonate, this LEGO Superman Clock measures about 9-inches tall x 6-inches long x 2-inches wide and requires 2x "AAA" batteries (included). Ages 6 and up. Finally! Keep Gotham and Metropolis Local Times Straight with these Batman and Superman LEGO Clocks!